What is Perfect Amino? The Vegan Amino Supplement. I’m updating this post because of the importance amino acids have in healing the body. More than just building muscle tissue, these aminos will go the parts of the body that need repair because there is no nitrogen waste which comes from eating a lot of animal products. I’ve added a brand new video, HOW TO TAKE PERFECTAMINO, check it out! Do you think by eating enough animal protein, or drinking many protein shakes, that your body is actually able to utilize all the protein and able to convert it into essential amino acids? This information might interest you. I love this product and I have found it, to have changed my skin and muscle tone. I am a non animal eater and get plenty of protein from vegetable source’s, such as hempseeds, pea protein and Spirulina, also I eat a large amount of fresh vegetables daily, but found as I got older it was harder to keep great tone. With Perfect Amino I have not only seen a difference in my skin, but also my muscle tone.The best is the new quality of my workouts. PerfectAmino™ contains the eight essential amino acids the body needs to support and maintain its muscular, skeletal, enzymatic, and hormonal systems. The essential amino acids in PerfectAmino are in the exact proportions needed for maximum utilization by the body. 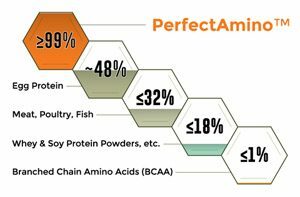 PerfectAmino™ Nothing else is utilized as well to make protein. 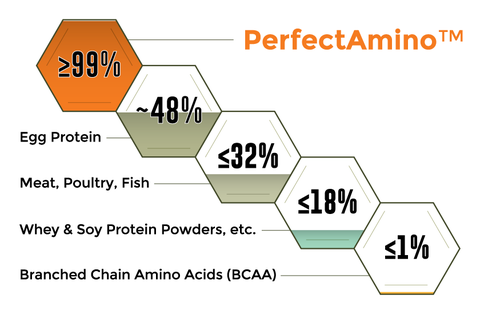 The chart illustrates the AminoAcid Utilization (AAU™) that Perfect Amino offers, dramatically greater than dietary protein sources and equivalent to the utilization of MAP. o At the low end of the spectrum are branched chain amino acids – only 1% of their content is utilized by the body with 99% resulting in waste that your body must then process and eliminate. o Whey and soy proteins – only 18% or less of their content is utilized by the body with 83% leaving as waste. o Food like meat, fish and poultry fare a bit better with 32% being absorbed and 68% being wasted. o Eggs are the winners in the food stakes with 48% being utilized and 52% converted to waste.